In our continued effort against the West Nile Virus, the City of Duncanville has authorized the Dallas County Health and Human Services (DCHHS) to conduct ground spraying against mosquitos on Thursday, September 15, Friday, September 16, and Sunday, September18, in the Thrush Avenue area from 9 p.m. thru 5 a.m., weather permitting. A positive mosquito trap pool for the West Nile Virus was reported by the County in this area. Click here for spray map. The City of Duncanville is currently accepting applications from citizens interested in serving on the City’s Civil Service Commission. Currently, there is one vacancy on the Civil Service Commission which is comprised of three members appointed by the City Manager for a three-year term, subject to ratification by the City Council. The selected individual will be asked to fill a vacated position with term date beginning in October, 2016 and expiring in October, 2019. The Civil Service Commission has the responsibility to adopt, publish and enforce rules pertaining to: examinations for entry level and promotional eligibility; procedures for appointment and certification; proper conduct of appeals of testing and examination scoring; prescribed cause(s) for the removal or suspension of a civil service employee; procedures for hearing of appeals concerning indefinite suspension, suspensions, promotional bypasses or recommended involuntary demotions; and other such matters reasonably related to the selection, promotion and discipline of civil service employees, which includes all sworn personnel in police and fire. To be eligible to serve, one must be a U.S. Citizen over 25 years of age and of good moral character, a current resident of the City of Duncanville for more than three years, and not have held public office within the preceding three years. Applicants will be interviewed by City Manager Kevin Hugman. Interested individuals are encouraged to forward a completed application to City Secretary Mary E. Jones, P.O. Box 380280, Duncanville, Texas, 75138-0280. A Civil Service Commission application may be obtained at City Hall or by visiting the City’s web page at www.duncanville.com. For more information, please call 972-780-5017. In our continued effort against the West Nile Virus, the City of Duncanville has authorized the Dallas County Health and Human Services (DCHHS) to conduct ground spraying against mosquitos on Thursday, September 1, Friday, September 2, and Sunday, September 4, in the E. Little area from 9 p.m. thru 5 a.m., weather permitting. A positive mosquito trap pool for the West Nile Virus was reported by the County in this area this week. Click here for spraying map. 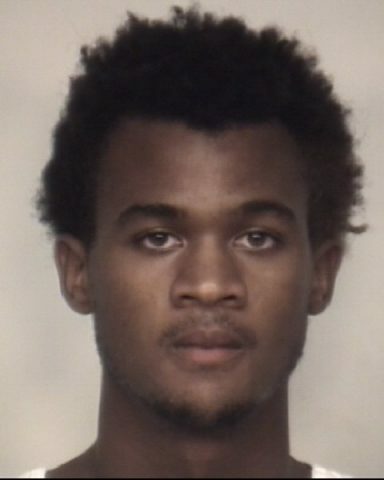 A 19-year-old Dallas man suspected in aggravated robberies in Duncanville and several other Dallas area cities was arrested by Duncanville Police Detectives on Wednesday, August 24th. Duncanville Detectives received a lead from Cedar Hill Police Detectives and were able to obtain an arrest warrant for the suspect. The suspect was seen in surveillance footage from several offenses threatening employees with a machete. Harron Jamal Jennings was charged with a First Degree Felony, Aggravated Robbery of the Shell convenience store at 602 South Clark Road in Duncanville on August 16th. Jennings is accused of brandishing a machete and robbing the store of cash and cigarettes. During the robbery, Jennings was wearing a burgundy hoodie with a Mesquite High School logo on it. Suspect Jennings was arraigned on an Aggravated Robbery charge with a bond of $25,000 and has been transported to Dallas County Jail. In our continued effort against the West Nile Virus, the City of Duncanville has authorized the Dallas County Health and Human Services (DCHHS) to conduct ground spraying against mosquitos on Thursday, August 25, Friday, August 26, and Sunday, August 28, in the Highgate Dr. area from 9 p.m. thru 5 a.m., weather permitting. A positive mosquito trap pool for the West Nile Virus was reported by the County in this area. Click here to see spraying map. For more information on the scheduled ground mosquito spraying in Duncanville, contact the City’s Health Inspector at 972-740-1163 or visit www.duncanville.com. On Wednesday, August 17, the Kroger located at 200 West Camp Wisdom Road hosted a ribbon-cutting ceremony to celebrate the completion of its latest remodel. The store now features new décor, improved deli, updated bakery, refreshed produce department, and enlarged pharmacy-waiting area. Front (from left): Bethany Blankmeyer, district manager for the Kroger Dallas division; Jackie Kreda, real estate specialist for the Kroger Dallas division; Andrea Landry, store manager for the Duncanville Kroger; and April Martin Nickels, public affairs manager for the Kroger Dallas division. The Duncanville Police Department is requesting the public’s help in identifying and locating a robbery suspect that entered a Duncanville Pizza Hut, located at 210 South Cedar Ridge Dr., on August 15th at approximately 9:46 p.m. According to reports, the suspect displayed a handgun in his waistband and handed the clerk a note demanding money. He fled on foot with stolen money from the cash register. The suspect was described as a black male, in his 20’s, measuring 5’8”, and wearing a yellow hat, Dallas Cowboys shirt, jeans, and grey shoes. 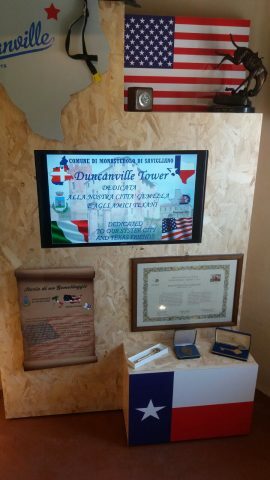 Duncanville’s Sister City, Monasterolo di Savigliano in Italy, has dedicated a special corner of its remodeled castle entitled “The Duncanville Tower.” The corner, located in the southeast tower of Il castello di Monasterolo di Savigliano, displays a movie about the City of Duncanville and the history of the Sister City relationship. A grand opening was held in June during Texas Senator Jane Nelson’s visit to Monasterolo di Savigliano. “It has been a great moment where we remembered the history of the Twin City Relationship and the big friendship between our cities,” said Marco Cavaglià, Mayor of Monasterolo di Savigliano. In March of this year, Mayor Cavaglià visited Duncanville to reaffirm the partnership and friendship between the two cities. City leaders showcased Duncanville and held a reception at City Hall honoring Mayor Cavaglià and wife. The relationship had its earliest beginnings in 1994 and 1995 through the friendship between Drs. Nancy and Cecil Wood (Dentists in Duncanville at the time) and Mr. Dario Crosetto (a Physicist formerly with the “super collider” and a native of Monasterolo di Savigliano, Italy). In 1998, the Duncanville City Council passed a resolution supporting the “twin-city” (Gemelaggio, in Italian) relationship. 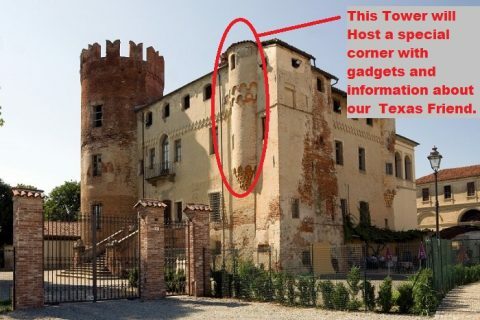 In July, a delegation of 13 Texans including State Senator Jane Nelson, were led by Mayor Glenn Repp to Monasterolo di Savigliano to participate in a formal ceremony instituting the arrangement. Italian dignitaries attended the celebration. In September 1999, a delegation of 39 Italians from all walks of life visited the City of Duncanville to formalize the Sister City program. During their stay, they were hosted by local citizens. A formal ratification ceremony was held at City Hall on September 28th with an exchange of documentation and gifts. Local dignitaries, including City Council Members and Staff, Duncanville Independent School Administration Officials, and the Honorary Vice Council of Italy participated. The visitors were treated to tours of local businesses, as well as a visit to the State Capitol, San Antonio, Galveston, and the Houston Space Center. They witnessed the Duncanville ISD homecoming parade as well as a football game. Exchange visits to Italy and Duncanville continued from 2003 to 2006, where cities such as Venice and Lake Como were toured, and more memories were created. Since these initial visits, there have been numerous personal exchanges between citizens of both cities while friendly communication continues to this day between families and young people in both communities. The City hopes to renew visits to Italy in the coming years. Plans include establishing a committee made up of citizens and staff that would facilitate this opportunity to other Duncanville citizens. The Duncanville Police Department is requesting the public’s help in identifying and locating two separate nonrelated robbery suspects. The first offense occurred on Monday, August 15th at approximately 10:39 p.m. Duncanville Police was dispatched to a robbery in progress at the Quick Trip located at 102 East Camp Wisdom Road. The suspect was described as a black male, 40-45 years of age, measuring 5’7”-6’, weighing approximately 220 lbs. and wearing a camouflage Ford hat, white t-shirt and black pants. Witnesses say the suspect stole a plastic tub full of cigarettes from behind the counter. When confronted by employees, the suspect directed them to “back off” as he reached behind his back. A second nonrelated offense occurred on Tuesday, August 16th at approximately 5:48 p.m. when a suspect entered a Duncanville Shell gas station at 602 South Clark Road and threatened the clerk with a machete. According to reports, the suspect stole money from the register and a carton of cigarettes before fleeing the scene running behind the business. The suspect was described as a black male, 17-23 years of age, measuring 5’6”-5’8” and weighing approximately 140 lbs. The suspect was wearing a maroon Mesquite hoodie with black pants. Click here for video of the Shell gas station suspect.